Taika Seiyu Oyata uses an eku on a beach on Okinawa. The sun bearing down on the bare backs of the boat rowers highlights the muscle definition in their upper bodies. They strain for speed to pass their opponents' boat, rowing equal and within an arm's distance. The rowers move as one as they press the ocean water behind them into the wake. The fronts of both boats cut a line through the ocean water gliding toward the same goal with wanton determination. A rippling ocean surface flashes white sun behind the boats as they draw closer to the finish point near the shore. The glare of white light flashing off the water causes the villagers on shore, who came to watch the ancient race, to squint as their bodies bob and weave in the sand to position themselves for a better view of the finish. This ancient Ryukyuan (Okinawan) ritual is a race that is held every year between two villages and both sides spend the entire year anticipating the event so they can celebrate their victory over the other village. The villagers will tell stories about the exploits of the event for decades to come as their traditions dictate. As the two boats come closer to the finish line, two representatives, one from each village, watch the boats intensely to determine a winner. The spectators cheer their team on. The rowers on both teams frantically slap their eku (boat oars) in the water as they approach the last few feet of the race. The two judges jump in the air clapping their hands as the two boats cross the finish line and the entire crowd of spectators yell and applaud enthusiastically, both sides claiming victory. Both teams of competitors hop out of their boats jumping up and down and congratulating their team-mates on a hard fought victory. Suddenly the eyes of the opponents meet in the middle of victory celebrations and they become quiet as quickly as they had begun to celebrate. They realize the judges are heatedly arguing over who the actual winner of the race was. The two teams rush over to the representatives simultaneously and listen intently for about 30 seconds, as the debate intensifies. The morning sun is making the sand on the beach hot. The shouting of the two representatives grows in pitch and the two rowing teams begin to shout at each other. Suddenly, fists begin to fly, bodies begin to roll in the sand, clinging and swinging at one another and an all-out free-for-all begins. Quietly and quickly an older gentleman steps out of the crowd and picks up an eku lying near the confusing altercation. With relative ease, the gentleman moves into the centre of the uncontrolled mass. The eku appears to move but then disappears, and all that can be seen is a whirlwind cloud of sand. The eku and the elderly gentleman appear in the cloud of sand as a silent silhouette. The eku gently trips a rower and several bodies fall over the hunched figure. Within a few moments the heavy cloud starts to settle and all that is left is a lingering hint of light dust in the air. The man had used the eku to throw sand at the rowers engaged in the fight, all of whom were disabled and lying either on the ground, coughing and gagging, or walking blindly around, rubbing their eyes and violently shaking the sand from their mouths, noses and eyes. The fight was over and there were no casualties. The elderly gentleman moves quietly away, tapping the eku in the sand as he walks. Taika Seiyu Oyata, a 10th-degree black belt and 79-years-old Okinawan Grand Master, teaches the ancient art of the Ryukyuan eku out of his international headquarters in Independence, Missouri, U.S.A. Taika Oyata (Taika' is an honorific title, in the same vein as 'Shihan') studied the art of the Ryukyuan eku under a retired bushi named Uhugushiku No Tan Mei, then in his nineties. Uhugushiku's best friend was another master of Chinese descent, and of similar age, named Wakinaguri No Tan Mei, and the young Oyata studied under him as well. Uhugushiku was a battle veteran with traditional Ryukyuan weapons and held the ancient secrets of tuite jitsu (grappling art), atemi jitsu (nerve strikes to the limbs) and kyusho jitsu (nerve strikes to the head, neck and torso) inherent within Ryukyu Kempo. Wakinaguri had chosen to retain and study his family's art of Chinese nerve strikes and is said to have practiced fingertip strikes straight into ocean coral for so many years that his fingers had all been worn down until they were even! Uhugushiku and Wakinaguri trained together for many, many years and, as they got older, became inseparable. Taika Oyata is the only living heir to the Uhugushiku family system of Ryukyu Kempo. The ancient art of kyusho jitsu that Uhugushiku taught includes the very secret touch strike to the neck area, delivery of which causes a would-be attacker to crumble in a sleep-like state to the ground...to remain so until revived. This touch strike can also be used to kill; however, it is used better as a warning that worse could follow. Taika Oyata is the only man alive in the world today to have received this information from Uhugushiku and who can actually perform the techniques correctly. The story of the rowing contest and the altercation that transpired is one of the explanations of the origins of the eku as a Ryukyuan weapon. In this particular incident it is noteworthy that no-one was injured permanently. The story leans toward the idea that the wielder of the weapon knew of its immense power to disable permanently or kill, and he merely chose not to do so. The Ancient Ryukyuan eku kata that Taika Oyata teaches are very sophisticated; not only are they difficult to learn and perform properly, but the techniques used in real situations are also very difficult to apply. The eku kata bunkai (kata interpretation) is also steeped in the ancient secrets of the Uhugushiku system, the emphasis of which is actual battle theory and application. 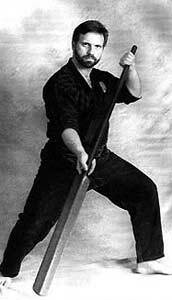 Shihan Bill Gossett is a student of Master Oyata. Two of the eku kata that Taika Oyata teaches are the 'Bushi Matsumura eku no kata' that originates from the village of Shuri, and the 'Bushi Machimura eku no kata' from the village of Tomari. It is believed that these two villages are possibly the two that had rowing competitions and ultimately resulted in the story of the fighting rowing teams and the emergence of the eku as a sophisticated Ryukyuan weapon. Taika Oyata also shows the power of his ancient technique in the complex form of 'Oyata Shin Shu Ho Ryu', best displayed in the kata 'Shi Ho Ha Po No Te'. The relaxed, gentle power of Taika Oyata and his philosophy of life synthesise themselves and reveal the ancient traditions of his life-protection art in this kata. The use of 'Shin Shu Ho' as an art form that protects not only the victim, but the assailant's life, is a major theme of Taika Oyata's philosophy. This philosophy on life harnessing itself within such a formidable art form is an extrapolation of what the authentic ancient Ryukyuan warrior pursued. The elderly man with the eku at the beach best exemplifies the life protection art of Taika Oyata. Upon stopping the two rowing teams from fighting, without injuring any of them, he quietly and calmly moves away, lightly placing the eku in the sand as he walks. Hopefully that imprint in the sand will stay with us as practitioners of the martial arts. Note: This article first appeared in "Terry O'Neill's Fighting Arts International" No. 90 1995 and is posted with permission of the author.